First Visit Dr. Marvin Bautista DC Bautista Chiropractic Care, Inc. 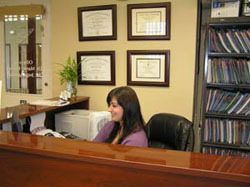 When you arrive at our office you will be greeted by our friendly staff. You will be asked to fill out new patient forms or sign the forms you submitted from our website. These forms will provide important information about you and your specific health condition. During the exam and consultation you will have the opportunity to discuss your health concerns and desired health goals. Dr. Bautista will take a thorough history regarding your specific condition, to determine which specific techniques are most appropriate for your condition. An examination will then be performed to determine the causes of your initial complaint or health concern. Dr. Bautista may refer you for X-rays or other specific testing used to aid in his ability to understand your health concern more fully. He will give you a complete report of findings and inform you of his recommendations for treatment and care.